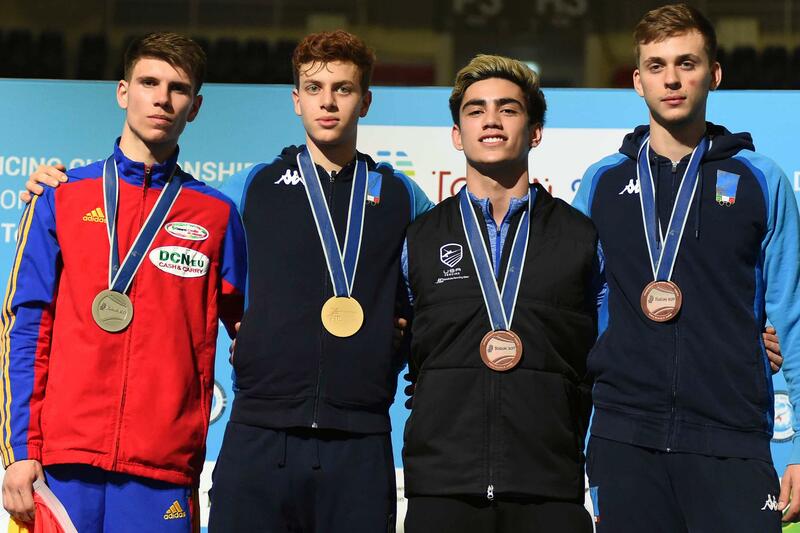 (Torun, Poland) – Eighteen-year-old Mitchell Saron (Ridgewood, N.J.) added his name to an elite list of fencers on Saturday as one of just seven U.S. men ever to have won an individual men’s saber medal at the Junior World Championships. Saron joins a roster that includes Olympians Eli Dershwitz (Sherborn, Mass. ), Daryl Homer (Bronx, N.Y.) and Ivan Lee (Brooklyn, N.Y.) with his bronze medal finish on the opening day of the Junior World Championships in Torun. A team bronze medalist at the 2018 Junior Worlds, Saron established himself as one to watch going into the tournament with three silver medal finishes on the circuit that gave him a No. 4 Junior World Ranking. In the pool rounds on Saturday morning, Saron cruised through his first five bouts before losing the final one, 5-3. The result gave Saron a No. 14 seed and a bye into the table of 64 where he defeated Karan Singh Singh (IND), 15-11. In the table of 32, 2019 Asian Junior Champion Hyeonmo Sung (KOR) led the bout, 11-8, before Saron came roaring back with a 7-1 run to take the win, 15-12. Saron put himself into the medal mix with his next win, taking another 7-1 run to defeat Francois Cauchon (CAN), 15-5. The win set up a rematch between Saron and his 17-year-old teammate, Kamar Skeete (Duluth, Ga.), who defeated Saron, 15-13, in the finals of the Junior Pan American Championships last month. This time, however, Saron only let Skeete get within two touches throughout the bout, taking an 8-6 lead early in the second period and closing out the bout at 15-10. “I knew Kamar was going to fence well and it was going to be a close bout. We always go back and forth and I just had to put it all out there,” Saron said. With a medal guaranteed, Saron advanced to the semifinals against Lorenzo Roma – an 18 year old Italian who was fencing at his first Junior Worlds to end a season that included four podium finishes on the World Cup circuit. Saron started the bout strong at 3-0, but Roma answered with eight straight to end the first period at 8-3. Saron regrouped in the second period, scoring three more before the Italian ended the bout, 15-6. Roma would go on to win gold and earn the World No. 1 ranking and Overall World Cup title for 2018-19 with Saron ending the season at Junior World No. 2. While the medal would be Saron’s first, he said he went into the tournament with the goal of becoming a Junior World Champion and is eager to return for another chance at the title when the 2020 Junior Worlds are held in Salt Lake City in 2020. With just one day of rest, Saron will return to the strip for the team competition with Skeete, Erwin Cai (Marietta, Ga.) and Christopher Walker (Atlanta, Ga.) to defend the team’s 2018 Junior World bronze. Placing seventh in Torun, Skeete also earned his top finish at the Junior World Championships after competing as both a junior and cadet at his first Worlds in 2018. Skeete went 5-1 in pools and fenced Pedro D’Avila (BRA) in the table of 128. The Brazilian took a 7-3 lead late in the first, but Skeete put up a 12-1 run to end the bout with a 15-8 victory. In the 64, Skeete earned a 15-11 win over Jules Geraud (FRA). He went on to control the start of the next bout against Hyeonseung Hwang (KOR), taking an 8-1 lead and holding off a comeback by the Korean for a 15-10 victory. Skeete claimed his fourth direct elimination win of the day in the table of 16, putting up an 8-2 run in the second to defeat Maksim Pinchuk (BLR), 15-10. The high school senior was one of four fencers from Nellya Fencers Club to compete on Saturday for Team USA – representing half of the eight total fencers on the men’s and women’s saber squads, including Cai, Walker and Tori Johnson (Peachtree City, Ga.), a silver medalist in the team competition in 2018, who came one touch short of winning an individual medal in Poland. Fencing at her second Junior World Championships, Johnson had a challenging start to her day, drawing a short pool and escaping with a 3-2 record in the women’s event. She won her next bout, easily, however, defeating Beth Taylor (IRL), 15-7, to earn a position in the table of 64. Down 0-3 to Claudia Rotili (ITA) at the start of the bout, Johnson came back to tie the score at four and end the first period with an 8-6 lead. She went on to close the bout with a 15-10 victory. Johnson was briefly challenged by Sugar Katinka Battai (HUN) in the 32 when the Hungarian earned three straight touches to take a 6-4 lead in the first period, but Johnson adjusted and scored 11 of the next 13 touches to take win the bout, 15-8. In the 16, Johnson ended the first period with an 8-5 lead and left little to doubt as she bested Hyunjeong Lee (KOR), 15-9. Johnson would take on breakout star Natalia Botello (MEX) for a position on the podium. Botello became one of the youngest Junior World Champions in women’s saber history in 2017 when she won gold at just 14 years old and followed with silvers at both the Junior and Cadet Worlds last year. Despite her resume, Johnson and Botello had never fenced each other in an individual event and Johnson was determined to score the upset as she pulled ahead at 12-11 in the second period. Botello scored three of the next four to regain the lead at 14-13 before Johnson put up a one light touch to tie the score at 14. Botello would take the last touch, however, and went on to win another silver medal with Johnson finishing eighth. In the men’s event, 2017 Cadet World silver medalist Walker came in with a hot start to the day at his first Junior Worlds. Walker went 6-0 in pools and blazed through his table of 64 bout, defeating Balazs Kaiser (HUN), 15-3. Walker held off Mohammed Alfadhli (KUW) at 15-12 in the 32 and held a 6-3 lead early his table of 16 bout against Bakdaulet Kuralbekuly (KAZ) before his opponent claimed the bout at 15-13. Fencing at his final Junior World Championships and seeking to add an individual Junior World medal to his 2016 Cadet World silver, Cai struggled in pools, ending the round at 3-3. The Harvard junior cruised through his first DE bout, however, taking a 7-0 lead against Javanshir Aghakishiyev (AZE) before closing the round at 15-7. Cai led Chak Fung Terence Lee (HKG), 8-4, at the break in the 32, but Lee had a spectacular second half as he went on to earn a 15-12 win. In the women’s event, 2018 Senior World Team member Chloe Fox-Gitomer (Portland, Ore.) was aiming to improve on her top-eight result at the 2018 Junior Worlds, but fell short with a loss in the 32. The Princeton freshman went 6-0 in the pool rounds and bested Paula Montoya (ESP), 15-6, in the 64. In the 32, Fox-Gitomer led the bout against Dorottya Berczy (HUN) early at 4-2, but requested a medical timeout late in the first period with the Hungarian up, 7-5. With the Hungarian leading the bout, 10-7, in the second, Fox-Gitomer scored two and tied the bout at 10 when Berczy received a red card for a false start. Berczy scored again and Fox-Gitomer answered, tying the bout at 11 before Berczy ended with a four-touch run and a 15-11 victory. A 2018 Cadet World Team member, 17-year-old Ryan Jenkins (San Juan Capistrano, Calif.) went 5-1 in pools at her Junior World debut, earning a bye into the table of 64, but she lost her DE bout to Dariya Drozd (RUS), 15-13. Columbia freshman Nora Burke (New York City, N.Y.) made the cut out of pools at 3-3, but fell in the table of 128 to Deyuan Ni (CHN), 15-14. Competition continues on Sunday when the cadet saber fencers take the strip with three men’s and three women’s fencers in action.